These unique fish have an upright position, a horse-like head, and a prehensile tail. The lined seahorse coloration varies from grey, black, brown, yellow, orange, and red. Their coloration is may change within the aquarium based on the colors of its environment. They range in size from 4” to 7.5”. 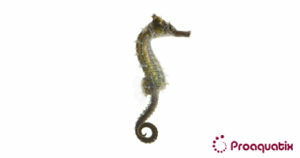 The Lined Seahorse is native to the United States and can also be found from Nova Scotia, Canada to southern Venezuela in South America. They do best when kept as a mated pair, or with a small group of its own kind in a species-specific aquarium. They may also be kept with small, passive fish such as, pipefish, dragonets, small gobies, and dartfish.